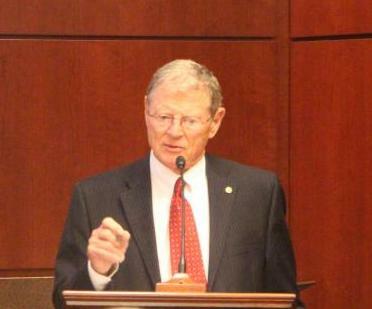 Senator James Inhofe's amendment is part of a bill recently passed to replace No Child Left Behind. Inhofe is seen here, speaking in Tulsa at a recent event. Senator James Inhofe’s amendment is part of a bill recently passed to replace No Child Left Behind. Inhofe is seen here, speaking in Tulsa at a recent event. Some of the toughest components of the No Child Left Behind era are coming to an end, much to the joy of education leaders across Oklahoma. The U.S. Senate voted to pass the bill, called the Every Student Succeeds Act, by a vote of 85-12 Wednesday. President Barack Obama will sign the bill during a ceremony Thursday. State Education Superintendent Joy Hofmeister was among many education leaders who called the new bill is a step in the right direction. While the Every Student Succeeds Act keeps in place mandatory testing, it does give states more flexibility in setting goals for schools, in creating school grading systems and in providing resources for academic remediation. Critics of No Child Left Behind, which was passed in 2001, said the bill’s goal of every student being proficient in math, reading and science was unrealistic, and that the punishment for failing schools was too severe. “This critical legislation … gives Oklahoma education stakeholders at the state and local level the authority and responsibility they have long sought,” Hofmeister said in a press release. At Tulsa Public Schools, Superintendent Deborah Gist said districts will have more flexibility in using alternative assessments for students in addition to more flexibility in how federal funding can be used. Both of Oklahoma’s Republican senators, Jim Inhofe and James Lankford, praised the outcome of Wednesday’s vote. An amendment pushed for by Inhofe and Sen. Cory Booker, D-New Jersey, was included in Tuesday’s bill. That amendment adds tracking the academic outcomes of homeless and foster children to data already collected for minority and special education students.